Milos was very personable, attentive to our needs and knowledgeable about the Kia lineup. Very friendly. I will be sure to recommend friends and family to work with Milos directly for any new Kia purchase. Very satisfied customer. The experience of buying a new car was very positive and stress-free. Milos cared about us as customers and as people. Thank you! Milos went out of his way to assist me with the purchase of my Kia Soul, including giving up time on several of his days off because it was more convenient for me. I recently bought a Forte LX Plus and I am very happy with the car. Ken, the assistant manager, sold me the car and is a knowledgeable sales agent. He gave me all the information I needed before I even took the car for a test drive. The staff was very pleasant and friendly every step of the way. To make matters even better, I won the draw for a 58" TV, which Ken personally delivered to my house... Now that's customer service! Thank you to all the staff members who had a hand in my experience. I usually don't write reviews but I felt very compelled to write this one. 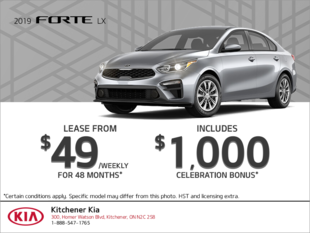 About a year ago I bought a car from this Kia location and my experience was so wonderful. Everyone that I dealt with on the sales end was so professional, friendly and accommodating. My salesman, Marco is so great at what he does and helped me every step of the way. Whenever I go into the dealership to get my car serviced I stop in to chat with Marco. He has made my experience with Kia so great, and I have passed this on to many friends and family members. I look forward to visiting Kia just so that I can catch up with the sales staff and have a coffee!